This article is being made in a response to That Guy T's video for racial pride. I recommend scrolling down and checking out that video prior to reading this article. Racial Pride - Is It Okay? For starters, it is in my overall opinion that people have a right to say what they want provided they are not inhibiting another persons personal freedom while doing so. With that being said I do enjoy that people freely speak their minds even if it is something that may not be conceived as a good ideal. 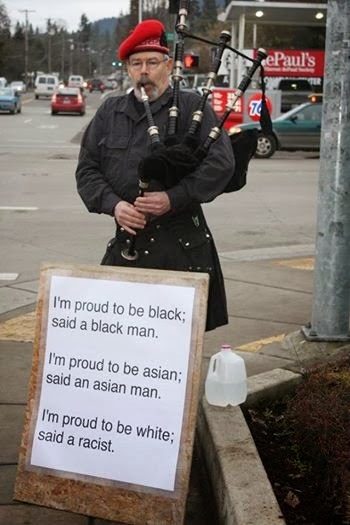 I think that racial pride can be a good thing but it is a very fine line from something similar to nationalism. Now I don't mean literal nationalism but really something very close to it except replace a country with 'insert race here'. Like a nationalist approach, you can have more modest nationalism which includes hanging up your flag of your respected country, sticking to foods and cultures that are native to your country, and generally being proud of your heritage. That is one thing to be thinking of and in this situation it means no harm to anyone, even the flag of the south is a representation of nationalism in the Confederacy. Then you have heavier nationalism that ends up getting races killed through genocide. Being it started with just simple jokes, separation and overall propoganda to push people into the direction of hating all but a specific race (I'm looking at you Germany) is where it melds nationalism and racial pride. What I mean is that racial pride is essentially a slippery slope. Yes I believe people should be proud of their race/origin/place of birth. Do I believe people should percieve their race as being superior to another race? I don't think so and most people don't as well. Response to Black Racial Pride. In response to black racial pride as presented by That Guy T in the video, I would have to say I really enjoy T's standpoint as I normally do. You can have a sense of general proudness of your diverse culture and then you can be black panther. You have senses of extremes that bridge from good to downright inappropriate or even insane. Just keep in mind, keep it relaxed and have a good time. Try not to focus so much on the prideness on your race and instead think about what you as an individual can do to look at life more positively.